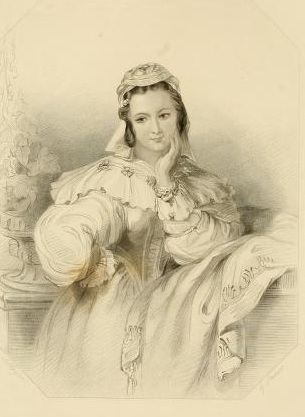 Beatrice, like many another woman before and since, is the slave of a pert tongue; her intellect, though quick, is not strong enough to keep her vanity in subjection, and the consciousness of possessing in a ready wit the power of discomfiting others, proves a successful snare for her good taste and all the graceful effects of her gentle breeding. It is only in situations so inspiring as to compel her for the moment to forget her flippant affectations, that she appears as Nature made her -- a spirited, generous, clever woman. One is apt to liken Beatrice to Rosalind; yet their only points of resemblance consist of dramatic situations somewhat similar, and the distinguishing endowment of wit. As to the quality of this gift, however, the two ladies so differ that it can scarcely constitute a characteristic in common between them. The wit of Beatrice, brilliant as it is, is but the dazzle of words -- it has no imaginative element, none of the half-playful pathos which renders that of Rosalind so charming; the two compare as the cold, artificial glitter of a diamond with the cordial warmth of sunshine. To use Benedick's own words -- and he, as chief sufferer, should be excellent authority -- Beatrice "speaks poignards, and every word stabs;" while, in the poetic simile of Mrs. Jameson, "the wit of Rosalind bubbles up and sparkles like the living fountain, refreshing all around." Palmer, Henrietta L. The Stratford gallery, or, The Shakespeare sisterhood. New York: D. Appleton and Co., 1859. Shakespeare Online. 20 Oct. 2009. (date when you accessed the information) < http://www.shakespeare-online.com/plays/characters/sisterhoodbeatrice.html >.